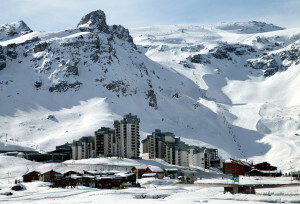 According to the World Snowboard guide ‘if Carlsberg made snowboard resorts they would have made Tignes’. Set at a high altitude at 2100 meters you can be assured that Tignes will have snow when the lower resorts are struggling. Tignes is one of the major resorts in France and has long been hosting huge events such as X games, The Brits, Frostgun and many camps, teams and manufacturers come to Tignes to host training camps and events. As well as the huge area in Tignes in the Winter, you can also ski here in Tignes in the summer time due to the Grande Motte Glacier at the top of the Funicular lift. Many camps are held here in the summer due to the epic summer park and the race training available.